Gordon Torbet was born in 1886 at Harrow to Archibald Torbet and Esther Sutherland. Archibald Torbet died in 1890 at Hamilton and Esther died in 1911, also at Hamilton. After finishing school Gordon worked as a brass fitter, an apprentice of William Irvine at Hamilton for twelve months. Gordon was also a member of the 11th Light Horse but resigned due to a change of residence. That was possibly when he moved to Moree, south-west of Harrow by 1909. By 1914, he was living at Connangorach, south of Horsham and working as a labourer. He also spent time at Harcourt where he was a member of the rifle club. Gordon’s two brothers remained Hamilton, Walter in Shakespeare Street and Alexander* in Goldsmith Street. His sister Helen Sutherland Torbet, better known as Nellie, was nursing at the 11th Australian General Hospital at Caulfield at the time of Gordon’s enlistment in December 1914. He named Nellie as his next of kin. Gordon also enlisted under the name of James Torbet. With the 5th Battalion, 3rd Reinforcement, Gordon arrived at Gallipoli on 5 May 1915 and was part of the Battle of Lone Pine in August. 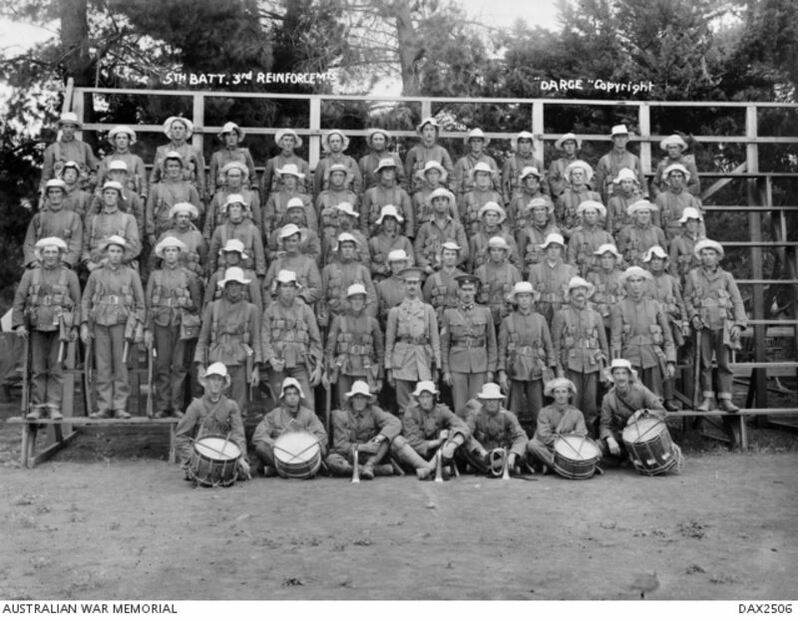 The battalion arrived back in Alexandria on 5 January 1916. Soon they were preparing for the Western Front with Gordon arriving in France on 30 March 1916. 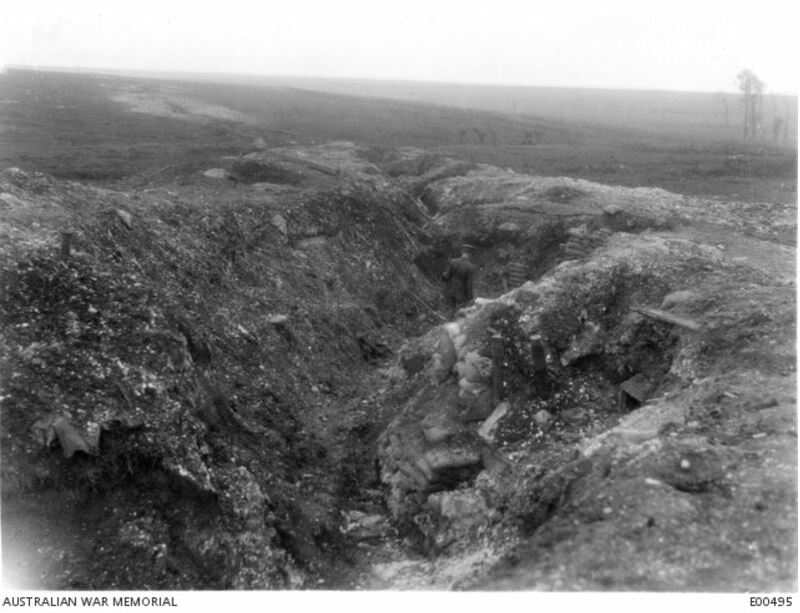 The 5th Battalion’s first major battle was Pozieres fighting in the front line trenches on 25 and 26 July and suffering heavy losses. They moved on 26 July and by 30 July arrived in Bonneville and billeted. On the same day, Gordon was charged with showing insolence toward an officer. He was soon to learn about Field Punishment. ** Gordon received Field Punishment No 2.(F.P. No.2). He also had to forgo some pay. 13 January 1917 – Absent from 2100 to 0700 on 14 January – eight days pay. 27 January 1917 – Absent from Tattoo Roll Call from 2200 on 27 January to 0700 28 January – seven days F.P. No 2 and eight days pay. Considering Gordon had no record prior to the Battle of Pozieres, it would seem that after Gallipoli and Pozieres, his morale like many others, was low due to the horrific experiences faced over the previous year. During February and into March 1917, the 5th Battalion was near Thilloy, south of Bapaume, France. They had been in and out of the trenches over that time. 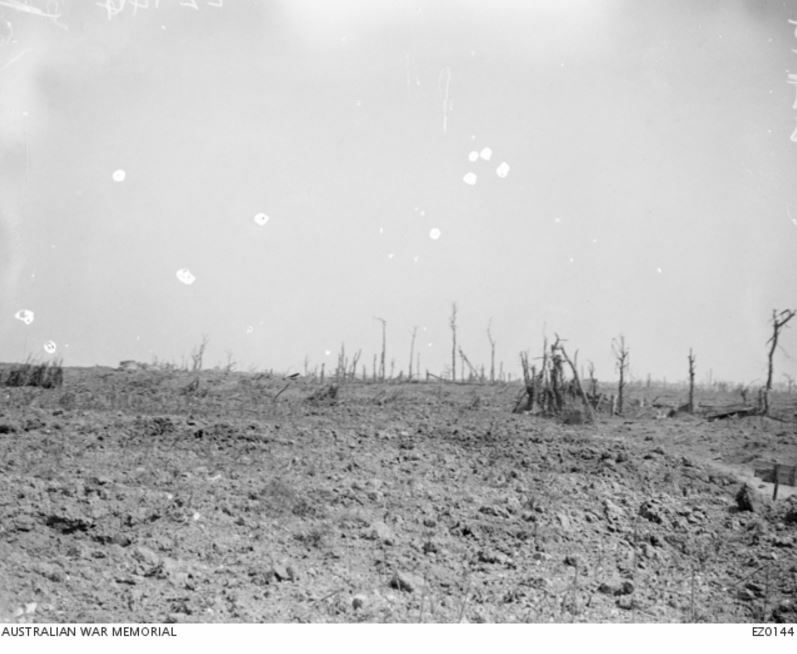 On 2 March, the battalion was in the frontline trenches when enemy patrols came at them from Till Trench (below). As a result of the attack, eight members of the 5th Battalion were killed and nine members reported missing. The following day, Gordon Torbet was also reported as missing in action. 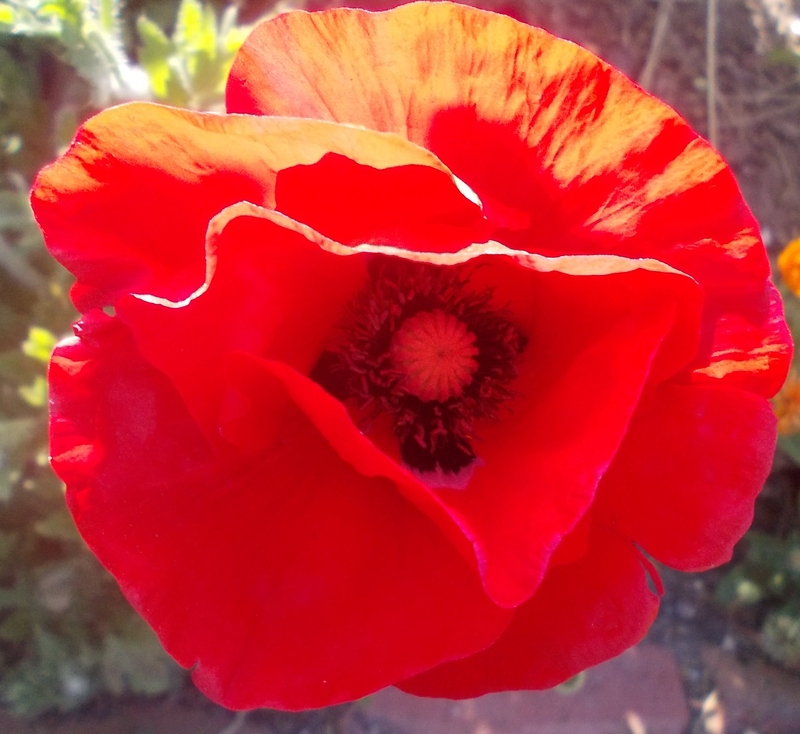 A witness’ account from Gordon’s platoon said the Germans took thirteen of their men prisoner. Two weeks later, the witness was passing the same area and found a grave with Gordon’s name on the cross. He thought maybe Gordon had attempted to escape his captors and was shot. On that evidence, it was found Gordon was killed in action 2 March 1917, buried south-west of Bapaume. Word reached home by the end of March that Gordon was missing and a report appeared in the Hamilton Spectator of 31 March 1917 after Gordon’s brother Alexander learnt of the news. It was mid-April 1917 before it was confirmed Gordon died on 2 March, and closer to May before the family received notification. Nellie placed a death notice in the paper The Argus (below). “Family Notices” The Argus (Melbourne, Vic. : 1848 – 1957) 5 May 1917 <http://nla.gov.au/nla.news-article1615596&gt;. Later in 1917, contacted Base Records believing he was next of kin. However, Base Record were looking for Nellie as nominated next of kin. Newspaper notices requesting information about Gordon or J.Torbet and his last known address was given as Spring Street, Melbourne appeared. It was not until March 1920 that Nellie and Base Records finally communicated with each other. She was at “Wjuna“, a nurse’s convalescence home in Geelong and expected to stay there another month. Nellie herself had enlisted and was in Egypt during 1919. 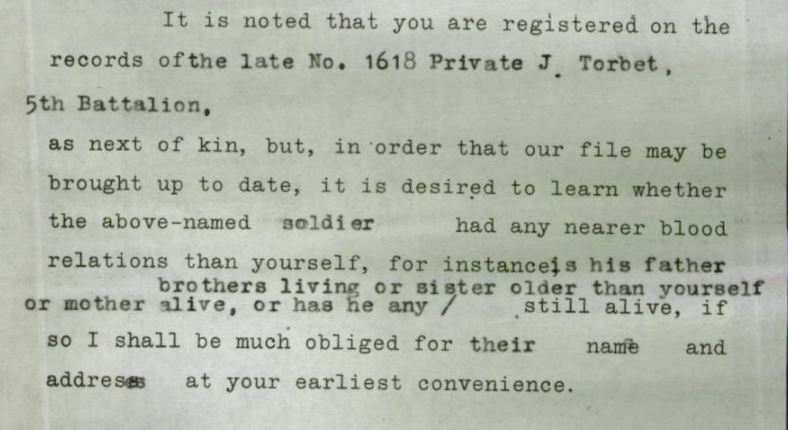 In the meantime, Walter as oldest living blood relative put in a claim for a war pension but it was rejected. Gordon’s niece Olga Torbet, a daughter of Walter, planted a tree for Gordon along Hamilton’s Anzac Avenue of Arbour Day 1917. Gordon’s name is also on the Hamilton War Memorial. *Alexander Torbet married my gg aunt Agnes Hadden, a daughter of William Hadden and Mary Mortimer of Cavendish, in 1908. **Field Punishment – There were two types of Field Punishment (F.P. ), Number 1 and Number 2. Field Punish Number 1 (F.P No.1) consisted of the offender remaining in irons for the duration of his punishment. For no more than two hours each day, the offender was attached to a fixed object, in view of his unit, as a means of humiliation. Hard labour was also during the period. Field Punishment Number 2 (F.P. No.2) involved the offender being in irons for the duration, however, they were not attached to a fixed object. Hi l am Sue Siketa (nee Agnew) My mother was searching the other day and found this information very enlightening. Her name is Moyna Agnew – my grandparents were Walter & Emma Torbet (nee Dreyton). My mother was Vida Lavinia Torbet and lived in Shakespear St Hamilton. They had 7 childern Olga and Archibald were the anmes of 2 children. I do not know much more so l have found this very interesting and would like to learn more information regarding this side of my family. Please contact my daughter at the email address below. Hi, I think Moyna is my cousin. We have the same grandparents.